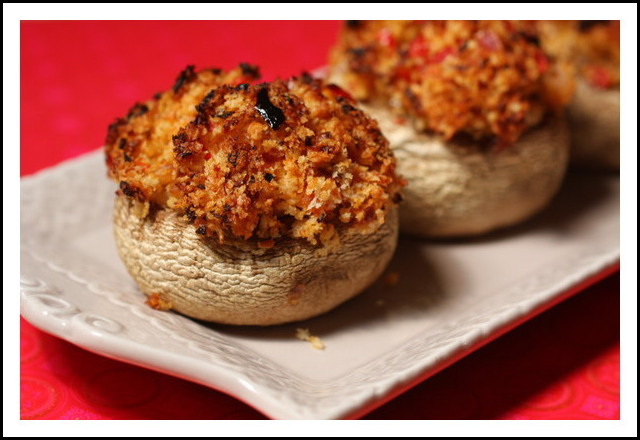 We had been craving stuffed mushrooms for some time. We kind of threw this together with what we had left over from previous meals. They turned out to be very tasty. We ate them for dinner with a spinach salad, but they would also make great party hors d'oeuvres. Remove the bottom part of the mushroom. Dice the bottoms along with the garlic, red onion, and red bell pepper and saute in pan with a little olive oil, salt, and pepper. Then add the mixture to a bowl and mix with the Panko bread crumbs. The bread crumbs will soak up the moisture from the garlic, onion, and pepper mixture. With a spoon scoop the mixture into the mushroom caps. Place the filled caps on a cookie sheet and spray the tops of them with a little olive oil. Bake at 350 degrees for 15-20 minutes until golden brown and crispy on top. them. We made ours a little more spicy than the recipe called. We actually used our slow cooker to make these instead of baking in the oven. 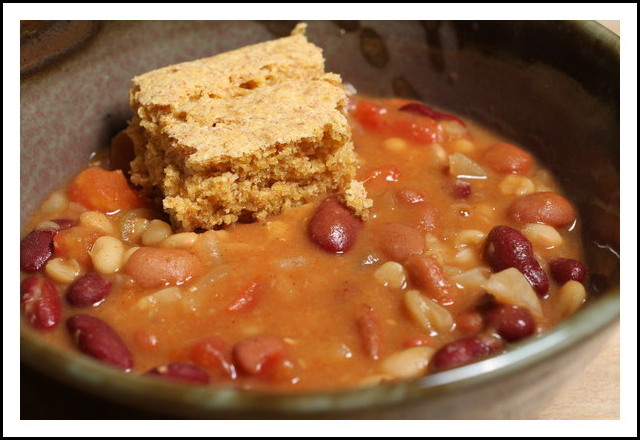 First rinse the white and kidney beans and add them to your cooker. Then add the mild chili beans. Dice the onion and tomato and add them to the beans. Then add the remaining ingredients to the mixture. We slow cooked on low heat for about 6 hours. You do not have to cook them for that long if you do not like.. As soon as the onions soften up you can go ahead and eat. This recipe is from Tony. He whipped this up one day after work and it was delicious. Tony doesn't measure when he cooks so below you will see the ingredients and you can add as much of each one as you would like! Sometimes things are just better that way anyway! In a pan add a little olive oil and two chopped garlic cloves. Then add in the sliced zucchini and mushrooms. After a few minutes add in the grape tomatoes. Boil the whole wheat linguine and then add the it to the olive oil, garlic, zucchini, tomato, and mushroom mixture in the other pan. Top with some freshly grated Parmesan cheese and enjoy!